England's women conceded two goals in the last three minutes to lose 3-2 to the Netherlands in their second match of the World League Final in Argentina. 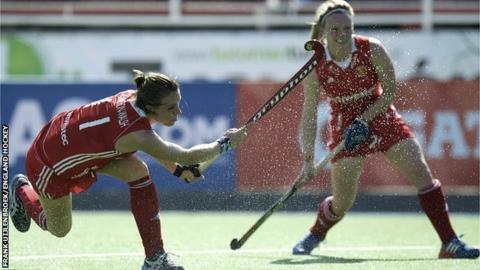 Coach Jason Lee's side, who beat Korea 6-2, went in 1-1 at the break after Georgie Twigg's goal from a penalty corner cancelled out Dutch skipper Maartje Paumen's sixth-minute effort. England went ahead with an own goal after a slick move from their own half. But Paumen and Kitty van Male grabbed two late goals for victory. "I thought the performance was ok, although not as good as we were aiming or hoping for," said Lee. "I didn't feel like we deserved to be 2-1 up at the end, the Dutch had created a lot of chances throughout the game." He added: "It was a strong defensive display overall, but it was our attacking play and creating chances that let us down - we need to be pushing a team like the Netherlands far more throughout the game, not just holding on. We gave the ball away too cheaply at times and in the end that cost us the game." England play Germany in their final pool A match on 3 December. The tournament features the world's top eight sides, with Argentina, New Zealand, Australia and China in pool B. All eight sides will progress to the quarter-finals.